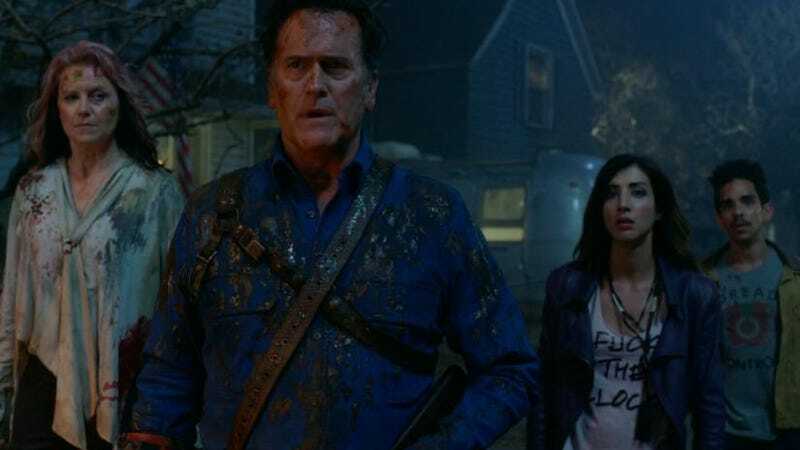 I’m finally catching up with Season 2 of Ash vs Evil Dead, now that it is on Netflix. Because man, I cannot convince people to drop HBO in favor of Starz. I know, I am alone in this mission. But anyway, so I watched episode 2 so far (no spoilers please! T.T) and My. Glob. By far, this was probably one of the grossest things I’ve ever seen. And I’ve seen Audition! Which... ..shudder..
Not sure if any of you watch Ashy Slashy but the scene involved a morgue. A body pulled towards Ash in a demonic fight while it still had some...excrements left in it. An open mouth. And Ash’s head finding a place in a very specific body cavity. Gross and hilarious. I don’t know how far that show is going to go this season. They keep pushing and I’m kinda scared to find out what’s left in the rest of the season because that scene will be hard to top. But I just know they’re going to try their best. What’s the grossest scene in a video game you’ve experienced? Something gory or implied (like the romance option for Persona 5's teacher pretty much skeeved me out)? What’s for lunch? And will it be as delightful as a giant soup dumpling? Oh hey, look at that. It’s National Soup Month apparently. What’s your favorite soup or can you not stand the stuff? Feel free to Talk Amongst Yourselves! Don’t forget that the Discord Chatroom is always around too for continuing, real-time conversations. If you wanted to give an admin, author, and/or friend a shout to tell them you love them and appreciate their internet availability: You can find them on the DirecTAYry.